The 36.21 metre motor yacht Nena 1 has been sold with Yachtzoo representing the seller and Yacht Nation acting for the buyer. Built in GRP by Cantieri di Pisa to a design by Carlo Galeazzi and delivered in 2009, this yacht for sale was the first in the yard’s Akhir 118 semi-custom series and was refitted in 2011. Nena I accommodates eight guests in a master suite, two matching VIP suites and a twin cabin, all with full en suite facilities. The main deck is dominated by the saloon which is split into two sections, one area for socialising and then a TV lounge. Two symmetrical corridors lead to stairs accessing the bridge and the full-beam dining room. Further forward is the crew galley with dinette and a stairway down to the three crew cabins for her five crew. On the flybridge, behind the two helm seats are a pair of large sun pads as well as a spacious open area and a kitchen unit aft with a huge C-shaped divan and two large tables that can be joined together for sociable al fresco dining. Twin 907hp MTU engines give her a cruising speed of 19 knots. 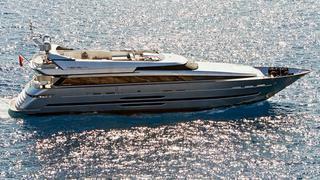 Nena 1 was for sale and asking €5.9 million.